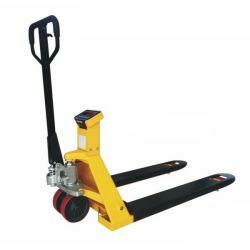 The Veritas VPS-5K pallet truck scale has a 5,000 pound capacity with a readabilty of 1 pound and 48 inch long by 27 inch wide forks. The Veritas VPS pallet truck scale is the easy way to weigh freight shipments. In ground floor scales and forklift scales are expensive and don't make sense for lower volume shippers. That's where the Veritas VPS pallet truck scale comes in to save the day and your wallet. Now you can take the scale to your load and not have to take your load to your scale. Made of this industrial steel and a bright 1.2 inch high LED display, weighing pallets and other loads could not be easier. Features a rechargeable battery and 4 heavy duty load cells.